Let’s paint a picture of a classic scenario. You walk into your kitchen and on the wall you see your calendar. You take a quick glance at it only to realize you have a major event coming in up in only (gulp) a few weeks! All your previous plans of getting ready for it somehow went out the window. Now you only have less than a month to get in the shape you wanted to fit into that dress or suit you bought specifically for this event. No time? Well, that’s no problem for Autumn Calabrese and her 21 Day Fix. In just 21 days you can get the body that you need to show up and sizzle at any event. But the best part is, that Autumn not only gets you a great workout in only 30 minutes, but she also takes the guess work out of your eating plan as well! It’s simple fitness, simple eating, and fast results. Autumn Calabrese is a jack-of-all-trades. She’s a celebrity fitness trainer, a national-level bikini competitor, workout program engineer, and a busy mother. Being the wonder woman that she is, Autumn understands how difficult it can be to exercise and eat healthy in your busy jam packed day-to-day lives. That’s why she developed 21 Day Fix. She created short 30 minutes workouts that anyone could do no matter their fitness level. She also developed portion-control containers to help individuals see how simple it is to eat the right amount of food to help them lose weight. And you don’t have to spend hours in the kitchen, or gym for that matter, to make it happen. It can all be done in the comfort of your own home and in a time that anyone can accomplish. 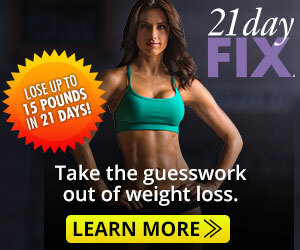 Regardless of your fitness level, anyone can achieve amazing and fast results with 21 Day Fix. Whether you are like the person in our scenario looking to get into shape fast, or just someone who is ready to take that next step into fitness, this program is for you. It combines 6 boot-camp style workouts that will burn fat and help you transform your body in only 30 minutes a day. And the only equipment you’ll need is a yoga mat and some dumbbells. Plus, when you order the complete kit, Autumn throws in a bonus workout to help you amp up your fitness level even more. The most unique thing about this program though, is how Autumn incorporates her 7 color-coded portion control containers. It completely takes the guesswork out of how much you should eat. There is a container for each of your fruits, vegetables, carbs, seed, oils, and healthy fats and cheese. All you have to do is fill up the containers with your own personal choice of food, and if it fits you can eat it! You no longer have to log your food, count calories, or track points. In 21 Day Fix everything is laid out for you perfectly so you never have to wonder if you’re over eating again. Total body transformation doesn’t need to take months on end. It only needs to take 21 days. So whether you are getting ready for a special event or you’re ready to finally get that body you’ve always wanted, let Autumn help you achieve your goals. And if you order the complete package you’ll get a few other essential tools in helping you succeed in your journey. Not only will you get the workout DVDs and the portion control containers, but you’ll also get a 21 Day Fix Start Here quickstart guide and workout calendar. You’ll also get the 21 Day fix Eating Plan that shows you exactly what do to and points you in the right direction to healthier meals. Two other things you’ll receive are the Shakeology shaker cup and the Dirty 30 bonus workout that will help burn even more fat and calories. Now is the time to start your transformation. An amazing body is not out of your reach. With the 21 Day Fix you will be able to reach your goals in a way you didn’t even think was possible. Time is no longer an excuse. All it takes is 30 minutes for 21 days. So are you ready? Join Autumn and her team as they take you on a journey of change. No time? No problem. 21 Day Fix is the answer.